Curriculum consultant Kate Reitzenstein with student Gwyneth Anggadjaja. Language Perfect is an online program that enables students around the world to compete against each other to demonstrate their mastery of a second language. Gwyneth, a Year 9 student, answered 73,028 questions and scored 32,880 points to take the top place out of 300,000 students. Association of Independent Schools WA Asia/Languages curriculum consultant Kate Reitzenstein presented Gwyneth with a $100 voucher and certificate at a special assembly. 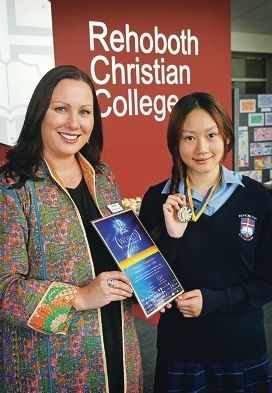 ‘We are extremely proud of Gwyneth and her extraordinary accomplishment,’ school principal Rob Stirling said. ‘Gwyneth is a student who shows the value of perseverance in everything that she does. Rehoboth ranked second of 78 schools in its championship category. Its Year 7 students Prischilla Kurnadi and Mukho Naw also ranked in the top 10 per cent, while Heleema Rawlings (Year 9) and Elizabeth Shaji (Year 10) both ranked in the top 20 per cent.